In early July Nancy and I began work on our new iPhone travel guide app, Virginia Wine In My Pocket. For our research, Nancy and I are trying to visit every winery in the Commonwealth of Virginia. This is a travel guide, not a wine critic’s guide, so wine festivals don’t count; we have to actually see and set foot in the winery and taste at least some of the wine on offer there. Just to make things fun, we also decided to set ourselves a deadline. When we started, there were a bit over 150 wineries in Virginia, so we gave ourselves 150 days to visit them all. It’s turning out to be a challenge. So far, Nancy tells me we’ve visited about 40 of them. Since we started this, it’s been all wineries, all the time: No time for photos or posts on any other subject. As we travel about and visit Virginia wineries, we are not asking for favors or anything … we just show up during their visiting hours, ask for a tasting, and chat with whoever happens to be there at the time. Of course, I’m also usually shooting pictures like a manic tourist, so we do tend to attract a little attention from the staff at each winery; It must be awfully off-putting to have some shutterbug apparently more focused on taking pictures than on tasting the wine. Sometimes we are lucky enough to chat with the owner, and sometimes we just enjoy the company of whatever friendly staff happens to be around at the moment. So far, we have always enjoyed the nice staff and the wineries we’ve visited; we always have a great chat and enjoy our time. Our experience with owners is nowhere near so consistent. Most of the owners we meet are wonderful, kind, and interested in our project. Sometimes they let us taste additional wines; a few have gone so far as to spend hours with us, showing us the property and discussing what they are doing and why. Nobody has ever turned us away or refused permission to take pictures for our App. Rarely, we come across an owner who is positively rude or secretive about their wines and winery. I never understand that attitude: I can’t imagine why someone would put themselves into daily contact with the public if they basically don’t trust or like their customers. Why not just hire some nice young person to be nice to the visitors, if one can’t find it in oneself to be nice? But then, I guess sometimes they have good cause. Just for myself, I doubt very much I would like to run a winery; especially on weekends there are thousands of visitors and many of them are just out to drink wine or party. We have also seen a number of self-proclaimed “wine bloggers.” Since it really doesn’t take a lot to print some “business cards” on your computer and then claim to “review” wines on a free blog, lots of people seem to do it. I hope most are not actually trying to get free stuff or special consideration based on their supposed expertise; alas, I suspect many are. I guess I can see why some owners might view bloggers with suspicion. But that’s not us. Nancy and I do not review wine. We report on what there is to do and what it is like to visit the winery. We’re building a TRAVEL guide. This entry was posted on Saturday, September 11th, 2010 at 15:40 pm. 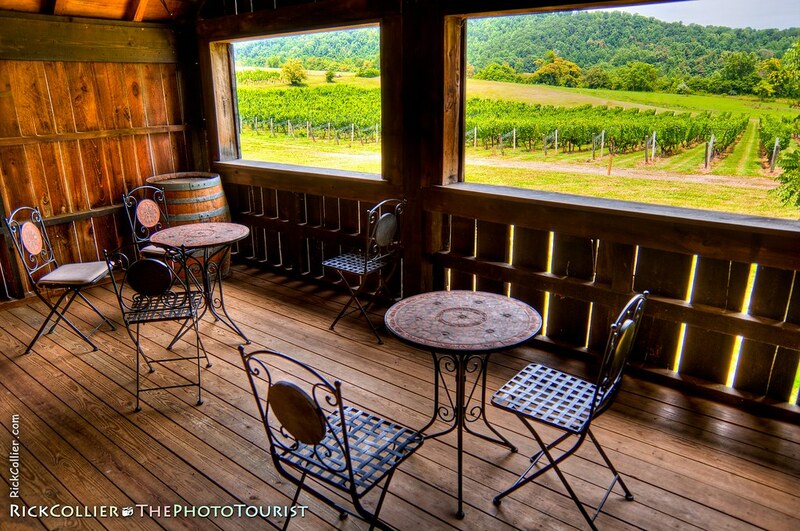 It is filed under thePhotoTourist and tagged with 150 wineries in 150 days, 150 wineries tour, antique, bright, deck, furniture, HDR, high dynamic range, IMP, In My Pocket, Land & Air, Nikon, photo, Photo Tourist, Photomatix, PhotoMatix Pro, Photoshop, PhotoTourist, porch, Ratcliff, shade, Sharp Rock, Sharp Rock Vineyards, Sharp Rock Winery, Sharp Rock Winery and Vineyard, Stuckincustoms, sunny, the Photo Tourist, thePhotoTourist, tour, tourism, tourist, Trey Ratcliff, tutorial, VA, VA Wine, VAWineInMyPocket, VAWineInMyPocket.com, view, vineyard, Virginia, Virginia Wine, Virginia Wine In My Pocket, wineries, winery, wood. You can follow any responses to this entry through the RSS 2.0 feed.